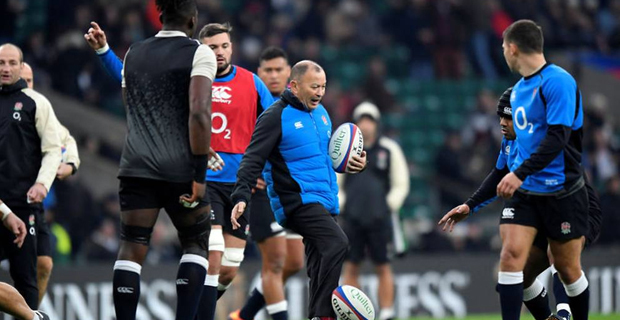 A new report has revealed England players were twice as likely to be injured in training with under Eddie Jones last season than the average since 2002 and those injuries kept them out of the game five times longer. The injury data report conducted by the England Rugby Football Union follows a year in which several players were sent back to their clubs unable to play after serious injuries sustained on international duty, leading to criticism of methods of the former Wallabies coach. Details on all injuries sustained by English professional players in club and international matches and training have been recorded and analysed since 2002. Although the 2017 18 figures concerning England came with the caveat that the relatively small sample meant the results could be skewed, they showed the incidence of injuries during on pitch training was more than double the average. The mean length of absence was 579 days per 1000 hours, compared to the overall mean of 96 days per 1000 hours. The injuries appear to be becoming more severe, or perhaps treated more sympathetically, as those suffering injuries in England matches were absent for an average of 30 days compared to 19 days during the overall study period. Last May, Bath owner Bruce Craig said the level of injuries sustained on England training camps was "totally unacceptable" after young prop Ben Obano suffered knee ligament damage expected to keep him out of the game for a year. He was one of several players who were sent back injured to their clubs and the fifth from Bath in recent seasons. Wasps flanker Sam Jones was forced to retire last year after suffering a catastrophic broken leg during a judo session with England in 2016. Jones, who took over after the 2015 World Cup, hardly endeared himself to club owners when he responded to Craig's criticism by saying they "had no right" to tell him how to prepare his team. The latest figures are not likely to placate them either but Nigel Melville, the RFU's interim CEO said action is being taken after discussions with the Professional Game Board.